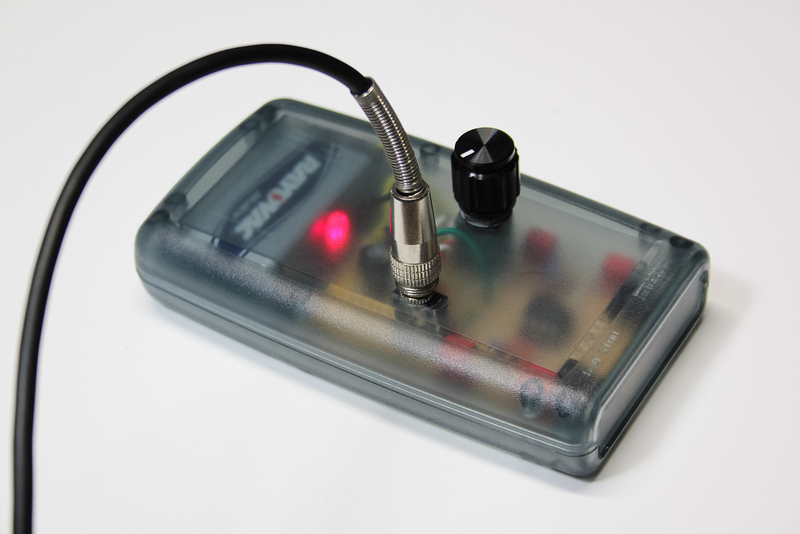 MAKE recently featured a very cool project that I had to build: the Elektrosluch! What’s an Elektrosluch? It’s basically a microphone of sorts that allows you to listen to electromagnetic interference (EMI) which is found all around us in our personal electronics, homes, automobiles, and many other places. The Elektrosluch includes a built-in amp, so listening can be done with headphones, or it can be connected to a recording device for sampling. 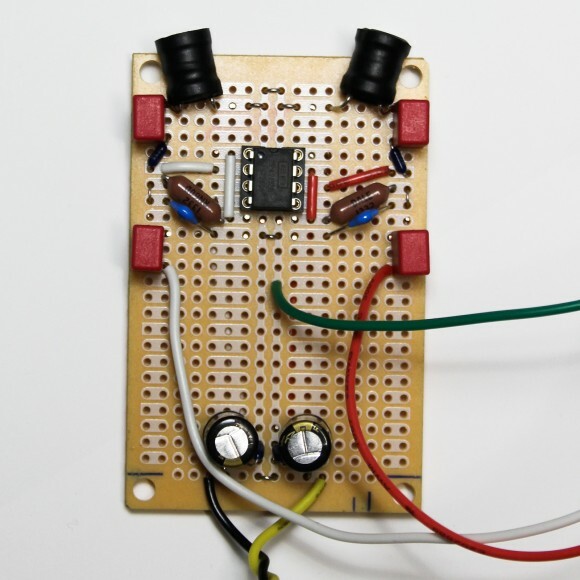 The tutorial was written by Jonas Gruska, who designed the circuit. It was a lot of fun to build, and overall not too hard. I took my time and checked everything multiple times and it worked the first time I tried it. I used the Radioshack 276-150 PCB instead of a perfboard. This was inspired by the Tangentsoft cMoy tutorial, which uses the same board. I’ve previously built a cMoy based on that tutorial and I like the layout used with the PCB. It works nicely since the middle tracks can be used as the virtual ground. I used a Serpac H-65 case to house the circuit, also inspired by the same cMoy tutorial. 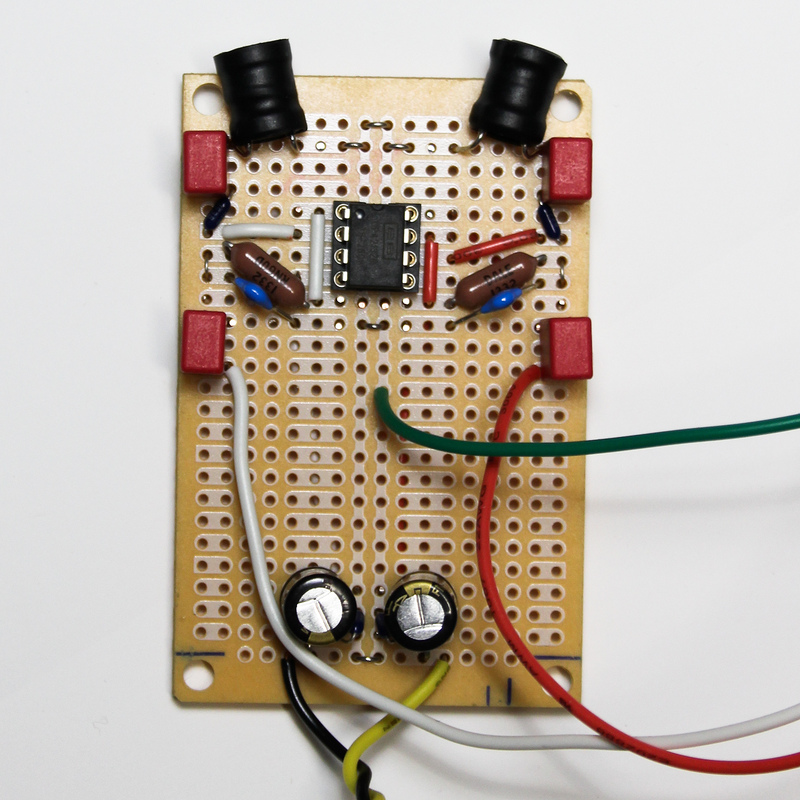 I used an OPA2132 OpAmp instead of the OPA2134. I still had some leftover from cMoy builds, and the Tangentsoft tutorial indicates they basically sound the same. I included some additional capacitors which are found in the pre-built Elektrosluch units. Specifically, 2 47pF capacitors in series with the 390k ohm resistors. When I inquired about them on the MAKE tutorial page, Gruska responded that “They offer high-frequency filtering to protect from RFI frequencies. However, in effort to make the design easier, I decided to not include them.” Including them was a challenge, but I got them in. I’m not sure how much difference it makes, but it probably would have been fine to leave them out and save a lot of hassle. I couldn’t resist trying it though. I added an Alps 10k ohm pot with built-in switch for volume and power control. Actually, it may be the same one used in the Elektrosluch Mini DIY Kit. I had some leftover from building cMoy headphone amps. Many thanks to Jonas Gruska for sharing his design and writing the tutorial, and to MAKE for featuring it! Originally posted April 20, 2016 on my old site; posted here April 6, 2018 with minor revisions.